Elevations Academy 2013: We Built this City: Imagine. Create. Lead. Sorry, public registration for this event has been closed. Please call our office for assistance. Using the City of Charleston’s “Imagine Charleston” comprehensive plan as a launching pad for discussion, the program will profile trailblazing women in WV history who took risks to advance their communities or businesses; feature an interactive community development exercise; present strategies for moving forward from the perspectives of the technology sector, the creative class, downtown businesses and large corporations; and close with a powerful call to action through formal remarks and performance art. 1031 Quarrier Street. Separate registration is required. Historically, some or all of the Elevations Academy has been approved for continuing education credit. This year’s agenda will be submitted for approval by the WV State Bar and WV Board of Accountancy. Opening speaker is Mary Beth Heydrick of DOW, the company’s business manufacturing technology leader. Based in Freeport, Texas, Heydrick will share perspectives on leadership, innovation, risk and change. Early bird registration is $90 for Alliance members and $100 for future members. A range of exclusive sponsorship opportunities is available. For more information, contact JoEllen Zacks, jzacks@charlestonareaalliance.org. Last year’s Elevations event attracted more than 300 attendees. 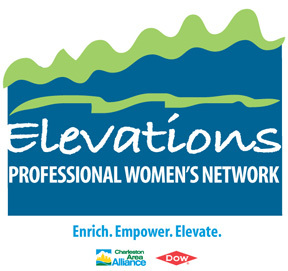 DOW is the title sponsor of Elevations. The Alliance will be able to invoice only for groups of 10 or more. Contact Deb Coffman at DCoffman@CharlestonAreaAlliance.org for more information. The Alliance cannot issue cancelation refunds within 48 hours of the event. Thank you. Organizations who purchase an expo table will be accessible and on display from 11 a.m to 5 p.m. These expo sponsors will also be featured during a portion of the event's scheduled networking activities. Reserve your table as soon as possible! Click HERE to sign up for the expo. Those interested in sponsorship opportunities, please contact JoEllen Zacks. Those interested in purchasing an expo table, please contact Matthew Thompson.